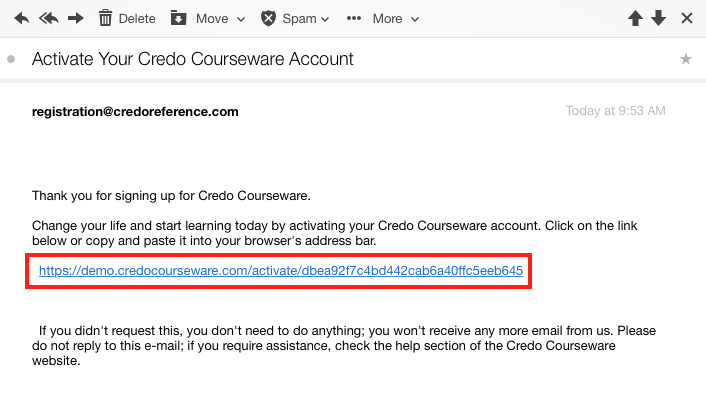 Summary: If you have clicked on an enrollment link, you will need to create an account before using Credo Education products. Step 2: You will then see a "Thanks for registering" message. You can then click on "View Course" to see the content. Step 3: You will automatically receive an activation email when you register their account. The email looks like this and yuo just need to click the activation link to complete your account creation. Step 4: Once you've activated your account, you will see a green confirmation message. From then on out, you can always go straight to your dashboard and just log in with this account.